Biointensive’s key components besides transplanting and double-digging are on-site composting, close plant spacing, use of seeds from plants that have been naturally pollinated and specific food-to-compost crop ratios. These methods are rarely practiced on large farms, where mechanization is more profitable, but they can be life-changing for the 90 percent of the world’s farmers who work 4 acres (2 hectares) or less by helping them to make the most of a given plot of land. Research shows that biointensive farms use 50 to 75 percent less land, 50 to 100 percent less fertilizer, 67 to 88 percent less water and 94 to 99 percent less energy to produce a given amount of food than does conventional farming. Perhaps most intriguingly, biointensive methods “grow” farmable soil — at a rate 60 times faster than occurs in nature — while traditional farming methods tend to deplete farmable soil through wind and water erosion. Much of the credit for biointensive’s global impact goes toEcology Action, which has brought Benedict, Mlegwah and about 100 other interns and apprentices to California mini-farms for internships since 2001. Headed by organic gardening pioneer John Jeavons in 1971 and funded by foundations and donations, the nonprofit teaches biointensive farming at three Mendocino County locations to agriculture activists and researchers from around the world who conduct research and then go on to teach others. Sitting at a pine-shaded picnic table overlooking the one-third-acre Ecology Action farm where Mlegwah works, the neatly bearded Jeavons, 74, sounds professorial while rattling off numbers. But there’s no hiding his passion for Earth-friendly farming or his concern for the world’s growing water scarcity and rapid disappearance of farmable land. Support for the methods have come from many quarters, including the Peace Corps, UNICEF and the 2010 U.N. Convention to Combat Desertification. Former U.S. Department of Agriculture Secretary Bob Bergland has called biointensive farming a potential way out for malnourished people worldwide. “That would be a remarkable development in this world, and would do more to solve the problems of poverty, misery and hunger than anything else we’ve done,” Bergland says in Jeavons’ book How to Grow More Vegetables. Each year, Ecology Action staff members choose up to eight individuals from outside the U.S. to participate in the internship program based on the food security needs of the interns’ native countries and the interns’ potential impact once they return home. Most have been from Latin America in past years, but biointensive has taken hold well enough there that 2016 interns are mostly from Africa. Interns attend one day of lectures and spend four nine-hour days per week learning on the farms. They stay from first planting in March to last harvest in November. As they master biointensive techniques, each intern conducts experiments on a separate 300-square-foot (28 square-meter) plot — slightly larger than a bowling alley lane — with the research findings then used to advance biointensive farming knowledge. Benedict beams with pride as she describes her experiment: comparing the seed and biomass yields of millet when it’s spaced in a hexagonal pattern at intervals of 5, 7, 9 and 12 inches (13, 18, 23 and 30 centimeters). Upon returning home to Ghana she aims to open a biointensive farming center with her husband. Ecology Action staff are helping her pursue funding. “The need is great because climate change has affected the rain pattern,” she says. “But farmers can get through famines by preparing the soil deeper so it can retain more water.” She is referring to double-digging — the aeration, or loosening, of soil down to 24 inches (61 centimeters) rather than the 6 inches (15 centimeters) or so customary on most farms — which makes roots longer, stronger and healthier; quadruples nutrient availability to plants; and permits closer plant spacing. Sammy Kang’ethe, a Kenyan who is planting potatoes alongside Benedict at the Golden Rule Community mini-farm, is also a serious student of agriculture. Less ebullient but just as driven, he taught HIV patients in Nairobi slums to grow food on small communal plots of donated land before starting this internship. “I saw that the HIV drugs didn’t work if patients didn’t also eat healthy food, so I came here to learn more about growing it in a small space,” he says. Kang’ethe’s experiments involve amaranth, artichokes and beets. “The goal is to empower people to grow enough food with less land and water so they can feed themselves and their families and even sell some in the city for income,” he says. Mlegwah, also a Kenyan, interns at the nearby Common Ground Garden. 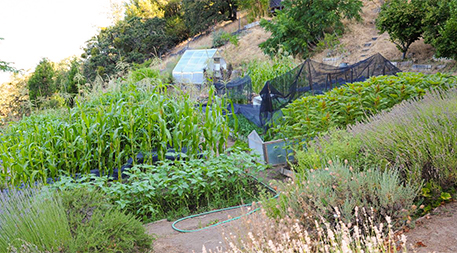 Common Ground has been here since 1982, when Jeavons broke ground at the first of three Ecology Action mini-farms in the county (backyard gardeners and schoolchildren are taught at a fourth farm in Palo Alto). Fellow intern Jean Apedoh is from Togo, where he was raised on a rice farm. For his experiment, he is growing rice with minimal water. 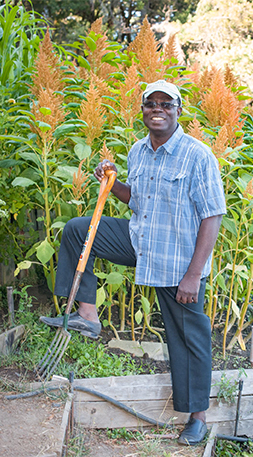 “Rice doesn’t need that much water, or any chemicals, to grow well,” Apedoh says. Through a nonprofit he founded in Togo, the agricultural engineer trained 2,000 farmers in 2015 before coming to Mendocino County to enhance his knowledge of sustainable practices. Like the soil at the farms, Jeavons’ spirit is constantly renewed by the interns who have come and gone, scattering the seeds of biointensive knowledge to small-scale farmers around the globe. He learned biointensive methods from British horticulturist Alan Chadwick — and notes that they were used for centuries in China, Japan, Korea, Greece, Guatemala, the Philippines and Iran. His mission is to bring them back to the world, which he’s done by establishing the intern program,writing a book and leading multi-day “Grow Biointensive” mini-farm workshops that have been completed by more than 2,000 people. While the Common Ground farm is at the end of a dirt road where the only sign at the turn reads “Another Way,” the nearby Golden Rule farm is less remote, on land owned by a back-to-the-land commune that dates to the 1960s. Ecology Action staff and interns help commune members farm the land and in return are given accommodations in an old bunkhouse and nightly dinners at the communal dining room. This model, with staff and interns all working, eating and living in close proximity, also applies at Common Ground and a third mini-farm at a Mendocino County coastal resort. That’s where a diet was designed that can feed one person on as little as 1 percent of the land that’s currently required to feed one average American. “We’re like a family, so it’s sad each year when the interns leave,” says Golden Rule co-field coordinator Rachel Britten. Gazing over the crowded crop rows that emit the fragrance of new grains, vegetables and seeds, Britten notes that much thought goes into what’s planted. “Carbon-and-calorie” plants such as corn, sorghum and barley — which offer high yields, calorie density and lots of stored carbon from which to make compost for soil replenishment — are a critical part of the system,” she says. So is balance, with a goal of 60 percent carbon-and-calorie plants, 30 percent root crops (such as potatoes, parsnips and leeks) and 10 percent traditional vegetables and fruits for dietary variety, vitamins and minerals. All edible and biomass yields are measured and soil tests ensure closed-loop soil fertility. 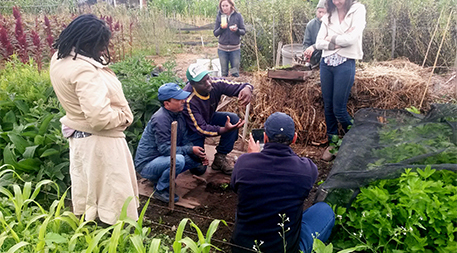 The successes stemming from mini-farm visits by agriculture students from abroad are legion. Juan Manuel Martinez returned home to Mexico to found the sustainable-agriculture organization ECOPOL in 1992, which has delivered instruction to a large portion of the estimated 3.3 million farmers who have adopted biointensive practices throughout Mexico, Central America, South America and the Caribbean. 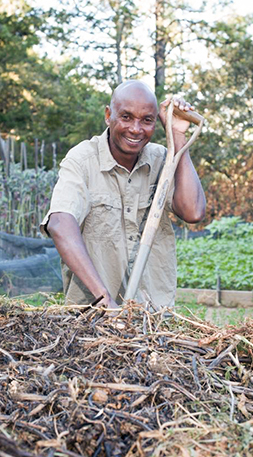 Boaz Oduor returned to Kenya in 2008 to help found Organics 4 Orphans, which trains farmers in Africa. In 2012, siblings Julio Cesar Nina and Yesica Nina Cusiyupanqui went back to Peru to train hundreds of farmers in the Andes. Four Sri Lanka interns visiting between 2012 and 2014 have gone on to spread biointensive practices throughout South Asia. Ecology Action is increasingly using the internet to spread information, with numerous free and low-cost videos, webinars and instructional materials in multiple languages at its websiteand educational portal, plus a growing presence on social media. But the heart of its efforts to plant the seeds of sustainable farming on every continent is still found at the mini-farms in the big-hearted zeal of the interns. “With biointensive, we could sustainably produce food for everyone on Earth and still leave half of the farmable soil untouched,” says Jeavons. It’s a big goal, but devotees of these farming methods believe they if they can convince enough people that it’s practical and essential, they can achieve it, one plant at a time.